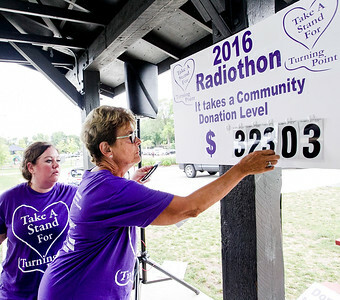 Sarah Nader - snader@shawmedia.com Turning Point employees Michelle Kennedy (left) of Devlan, Wis., and Lynn Broederdorf of Lake in the Hills change the donation amount during the 11th annual Take a Stand for Turning Point radiothon event, put on by Star105.5, at SageYMCA in Crystal Lake Friday, August 12, 2016. The event is the largest fundraiser for the domestic violence victim advocacy agency. 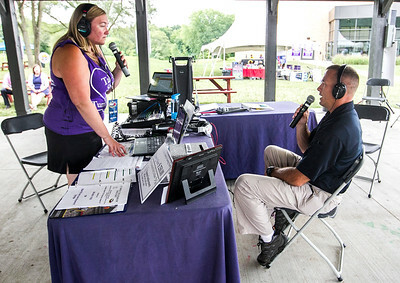 The event continues on Saturday from 6 a.m. top 4 p.m.
Sarah Nader - snader@shawmedia.com Star 105.5's Tyler Cox (left) interviews Woodstock Deputy Police Chief John Lieb on the radio during the 11th annual Take a Stand for Turning Point radiothon event, put on by Star105.5, at SageYMCA in Crystal Lake Friday, August 12, 2016. The event is the largest fundraiser for the domestic violence victim advocacy agency. 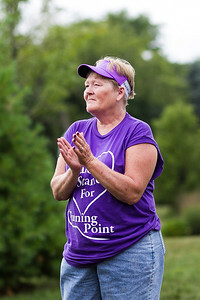 The event continues on Saturday from 6 a.m. top 4 p.m.
Sarah Nader - snader@shawmedia.com Turning Point employee Sharon Coker listens to music during the 11th annual Take a Stand for Turning Point radiothon event, put on by Star105.5, at SageYMCA in Crystal Lake Friday, August 12, 2016. The event is the largest fundraiser for the domestic violence victim advocacy agency. 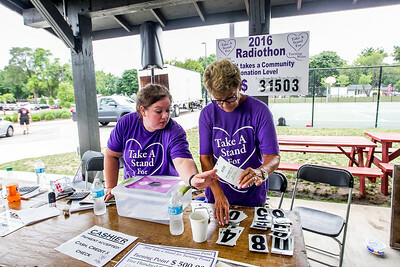 Sarah Nader - snader@shawmedia.com Turning Point employees Michelle Kennedy (left) of Devlan, Wis., and Lynn Broederdorf of Lake in the Hills count the donations do far during the 11th annual Take a Stand for Turning Point radiothon event, put on by Star105.5, at SageYMCA in Crystal Lake Friday, August 12, 2016. The event is the largest fundraiser for the domestic violence victim advocacy agency. 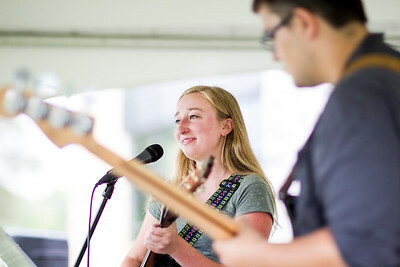 The event continues on Saturday from 6 a.m. top 4 p.m.
Sarah Nader - snader@shawmedia.com Cheyenne Hofmann of Crystal Lake plays music during the 11th annual Take a Stand for Turning Point radiothon event, put on by Star105.5, at SageYMCA in Crystal Lake Friday, August 12, 2016. The event is the largest fundraiser for the domestic violence victim advocacy agency. 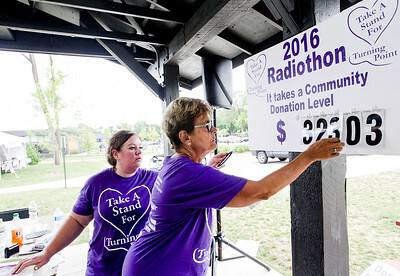 Sarah Nader - snader@shawmedia.com Heather Carey (left) of Crystal Lake and her daughter, Maddi Carey, 15, listen to music during the 11th annual Take a Stand for Turning Point radiothon event, put on by Star105.5, at SageYMCA in Crystal Lake Friday, August 12, 2016. The event is the largest fundraiser for the domestic violence victim advocacy agency. The event continues on Saturday from 6 a.m. top 4 p.m.